Are you looking for a safer, more natural and more holistic alternative for healing?Are you sick of the cost and the harmful effects of pharmaceuticals?Do you wish to explore the healing powers of crystals but are wondering where to begin?Ever since ancient times, healing crystals have a played a huge role in promoting physical, mental, emotional and spiritual wellness. This book will serve as your comprehensive guide to unlocking the secrets of healing crystals.Read this book for FREE on Kindle Unlimited – Download Now!The aim of this book is to take you through the step-by-step process of selecting and using crystals including instructions on performing crystal healing sessions for yourself and others. 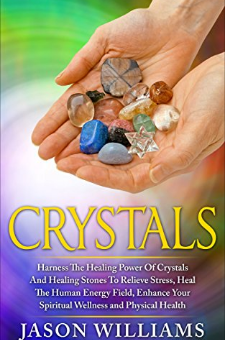 More importantly, you will learn practical ways of incorporating crystal healing into your daily routine so you can benefit from their healing powers on a day-to-day basis.Remember - You don’t need a Kindle device to read this book - Just download a FREE Kindle Reader for your computer, tablet, or smartphone!Through these pages, you will gain a deeper understanding of:What crystals are, how they differ from gemstones and how they workThe seven levels of the human energy field and the corresponding chakras and their relevance to your well beingWhich healing crystals work best with the different chakrasThe procedure for chakra balancingThe many practical ways of using healing crystalsThe best crystals to relieve anxiety and stress at work And much more...In the end, this book will help you enjoy a healthy lifestyle with the use of minimal to zero medication. More importantly, it will aid you in achieving that desirable balance of physical, mental, emotional and spiritual health.So, are you ready to become the healthiest and happiest version of yourself? Read this book today.